I am pleased to provide our New England Section members this Executive Summary of the AUA Board of Directors Meeting which took place in Orlando at the time of the AUA Annual Meeting. It is my privilege to serve the Section at the National level. I am your representative to the AUA, so please let me know if there are any issues that you would like the AUA Board of Directors to address. We are delighted to invite you to the 83rd Annual Meeting of the New England Section of the AUA. This year, we shall return to the iconic New England seaside resort, Newport, Rhode Island. The stunning Hyatt Regency Newport will serve as the headquarters for this meeting to be held October 16-19, 2014. The Welcome Reception offers a chance to renew old acquaintances and unwind after a day of science. Let us welcome you to the NE-AUA 83rd Annual Meeting by enjoying cocktails and hors d'oeuvres in the Exhibit Hall. Join fellow attendees and industry members for a cocktail reception in the Exhibit Hall. You will not want to miss the opportunity to visit 22 Bowen's Wine Bar & Restaurant for the NE-AUA President's Banquet. Located on Bowen's Warf in the heart of downtown Newport 22 Bowens' will provide attendees with a private-dining experience with a second floor wraparound deck and panoramic views of Newport Harbor. Come enjoy a relaxing evening with fellow meeting attendee to celebrate the end to a great meeting. Your guests will also want to join us at 9:15 on Saturday morning in Brenton Hall, our Main Science Room, for this year's Leadbetter Lecture. This year's speaker is Dr. Catherine deVries of the University of Utah, an internationally known surgeon and captivating speaker who is presenting a talk "Urology and Surgery in Global Health Policy: Engaging the United Nations." In today's world, the topic of global healthcare could not be more timely – we urge you not to miss it! Many urology practices around the United States may be experiencing difficulties in obtaining bacillus Calmette-Guerin (BCG) product for the treatment of bladder cancer. Earlier this month, the AUA learned that Merck encountered a manufacturing issue and had temporarily suspended its production of TICE® BCG. By September 14, urology practices were reporting shipments of BCG were once again arriving at their practice. National Government Services (NGS), the Medicare contractor that handles the Part B claims processing and payments for the entire New England Section has announced that the electronic remittance advice (ERA) system has been down since September 15. Medicare Part B payments continue to be directly deposited in the bank accounts of providers but the ERA used to automatically credit the payments to the patients' accounts is not functioning. NGS stated that they are diligently working on the problem and will update provider on the NGS website. By law, every health care claims payer must offer providers the option of electronic funds transfer (EFT) using (1) the ACH standard at a very low cost ($.34 per transaction) or (2) more expensive virtual credit card payments where they can charge a percentage of the payment (1.99-5%) plus a transaction fee. Information coming from the AUA Practice Managers' Network indicates that some commercial insurance companies are offering virtual credit card payments as the default method. This reduces your revenue per payment dramatically. Review your rights to make a choice at healthcare.nacha.org and instruct your payers that you are only willing to accept the ACH standard EFTs or a paper check. The 2014 Mid-term elections are rapidly approaching. Although a small, dedicated medical specialty might seemed dwarfed by all the Superpac dollars being spent this election cycle, there is still an important need for Urology to have an advocate on Capitol Hill. Our targeted giving strategy enables us to more effectively direct your donations to those legislators on key committees of influence. We also keep a pool of discretionary dollars to help our members foster new relationships with up and coming legislators and to thank our friends of Urology. Physician grass roots advocacy is still fundamental to initiating any legislative change as we continue to work on those issues identified by our members as critical to their ability to care for their patients. These issues include SGR repeal and/or reform, Urology workforce shortages, USPSTF transparency and continued patient access to PSA testing to name a few. These issues cross all lines and styles of practicing Urologists be they academic, employed or small and large group practices. UROPAC needs your generous contributions to support your profession and your patients. Go to www.UROPAC.org today. 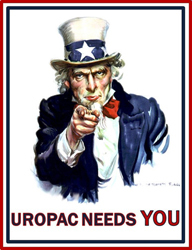 UROPAC needs YOU. 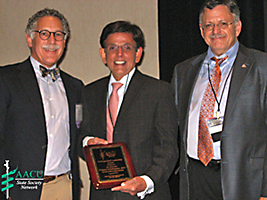 Connecticut State Representative Prasad Srinivasan, MD, R-Glastonbury, received a Distinguished Leadership Award from the American Association of Clinical Urologists (AACU), a national organization of specialty physicians, on Sept. 19 during the group's annual state advocacy conference. Rep. Srinivasan, also known as "Dr. S" by his Glastonbury constituents, gained distinction in 2012 as a freshman member of the House when he delivered an impassioned speech opposing changes to the state's medical liability law. Senate Bill 243 would have allowed patients to use a doctor in a "similar" health care field to provide a "certificate of merit" affirming a claim of medical negligence. Rep. Srinivasan successfully urged his colleagues to maintain the state's standard of requiring a doctor from the same specialty. When proponents of the change, led by lawyers who stand to gain if more frivolous claims are certified, tried to amend the law again 2013, Rep. Srinivasan halted the bill in its tracks once again. During an April 2013 hearing, Rep. Srinivasan explained, "when a person has a legitimate case…they will be heard, they will have their day in court. Instead of weakening this law, we need to address healthcare access and healthcare costs for Connecticut residents. "Dr. Srinivasan is a perfect recipient of our Distinguished Leadership Award," according to Seattle urologist and AACU Health Policy Chair Jeffrey Frankel, MD. The AACU Distinguished Leadership Award, presented to Rep. Srinivasan by AACU President Richard Pelman, MD, and Connecticut Urology Society President Arthur Tarantino, MD, recognizes elected officials and executive-level appointees who support the interests of the urologic community before state government. Previous honorees include Oregon Senator Alan Bates, DO; New Jersey Assemblyman Herb Conaway, MD and Washington state Senator Randi Becker. Rep. Srinivasan is seeking re-election to a third term in the Connecticut General Assembly, where he currently serves as ranking member of the House Public Health Committee. Additional information regarding the AACU's recognition of Rep. Srinivasan, including links to his campaign and official websites, may be found at www.bit.ly/aacu-DrS (case sensitive). 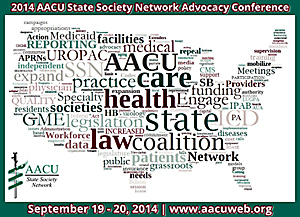 The 2014 AACU State Society Network Advocacy Conference attracted urologists with diverse experience and from varied practice settings with an agenda replete with public policy updates and best practices to support organizational development. Physician leadership was a theme that ran throughout various presentations and training sessions: Whether physicians would step up to reinvigorate a dormant state society or chair a health policy committee within their established state society; Whether individual urologists would contact their elected officials and offer to become an advisor on health care issues; Whether a doctor with a passion for public service would throw their hat into the ring and run for office themselves. Connecticut Urology Society President Arthur Tarantino, MD, proudly joined AACU President Richard Pelman, MD, in presenting the AACU Distinguished leadership Award to Connecticut State Representative Prasad Srinivasan, MD, R-Glastonbury. Rep. Srinivasan, also known as "Dr. S" by his constituents, gained distinction in 2012 as a freshman member of the House when he delivered an impassioned speech opposing changes to the state's medical liability law. 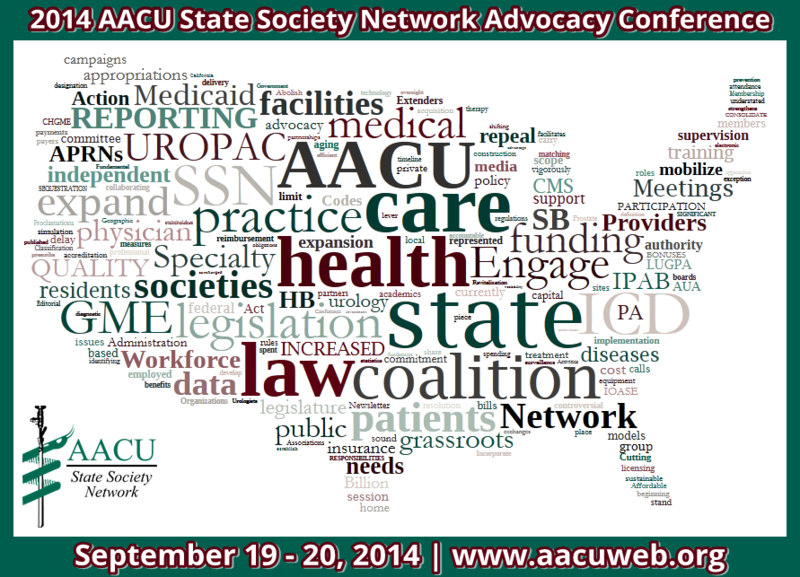 Read more about the AACU's Distinguished Leadership Award and the 2014 conference by visiting www.aacuweb.org. 1Of course, each of these urologists serves in various other capacities within organized urology. For the purposes of this event, however, these are the entities they represented.